The shul was running early by Neilah. Shofar blowing was scheduled for 7:37, but it was 7:10 and we were closing in on the end of Chazaras HaShatz. The Shliach Tzibur slowed down his recitation. We recited the entire Avinu Malkeinu responsively (instead of just the customary nine lines). As it turned out, that was quite a moving experience. We were on an emotional high at the close of the holiest day of the year. We all sang the last Avinu Malkenu together, beseeching God to grant us favor despite our lack of merits and asking Him for His charity and kindness. And yet, when we finished, we were still five minutes too early. So the Rav told the Shliach Tzibur to wait five minutes before we started Sh'ma Yisroel. We all had five minutes at this emotional and spiritual high point. 300 seconds. Some patiently waited. Some read or learned. Some took the opportunity to pray. I was one of the latter group. I had 300 seconds of unscripted, improvisitional prayer time at this most unique part of the year. I had 300 more seconds to pray for whatever I wanted, not just what was printed in the machzor. 300 final seconds to pour out my heart to God above. Some of the things I prayed for were selfish. I prayed that my family and I enjoy good health and happiness during the coming year. I prayed that we have good parnassah. I prayed that Walter do well in his new school and continue to grow in Torah. I prayed that George overcome his social issues and find happiness and friends. I prayed that Wilma continue to be the sweet, loveable girl that she is becoming. I prayed that Fred (the collective name for our kids) grow up to be people who are involved in Torah and Mitzvos their entire lives and be people that everyone in K'lal Yisroel can be proud of. I prayed that Eeees and I both have success in graduate school. I also prayed that a wonderful single girl whom Eeees and I know finally finds her chosson. I also prayed that those who are waiting for children finally be granted them. I prayed that specific people who suffer from various physical ailments be granted a complete recovery; along with all the other people who need a complete recovery. At some point, I moved on to things that were beyond the realm of my own circle. I prayed that this year there should be peace in K'lal Yisroel; that the various factions should stop fighting with one another. I prayed that it should be a year of greater understanding between the members of our seemingly hopelessly fractured nation. I prayed that this should be a year in which poverty and crime should be unknown among our people. I prayed that it should be a year in which everyone's prayers should be answered in the best way possible. And I finished by praying that it should be a year in which we finally see the coming of Moshiach. And just as I finished, the chazzan called out "Sh'ma Yisroel..." My 300 special seconds were up. Normally, on Yom Kippur, we say Avinu Malkeinu (Our Father, Our King) after each of the services. This year, however, because Yom Kippur comes out on Shabbos, it will be omitted (as the prayer is always omitted on Shabbos). Nonetheless, it *will* be recited following the last service, Neilah, at the close of the day. My question, very simply, is why? 1. Since it is after shkiah (sunset) and it is only a safek (doubt) as to whether it is really Shabbos or not (depending on whether the day begins at shkiah or tzais hakochavim [when the stars appear]), we say it. 2. Neilah, being the last prayer of the day, is meant to end on a spiritual and emotional high note, and so the prayer is recited anyway, *despite* the fact that it is Shabbos. Of course, the real answer could be a combination of these, or neither of the above. Menachem Boas -- Is He Still Working? 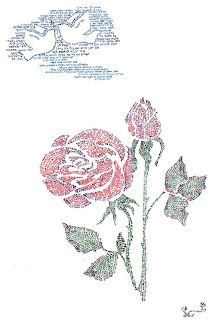 There is an artist named Menachem Boas, who specializes in the art of micography (also called microcalligraphy). This is an art form where words are used to form pictures. There are many micographists in the Jewish community. Menachem Boas, however, is generally regarded as the best of the bunch. While most micographists work in black and white, he works in color. I first came across his works about twenty years ago, when I visited my aunt and uncle in Baltimore. On their wall, they had a Boas print. It was a picture of Mordechai leading Haman around on a horse in Shushan. The text consisted of the entire book of Esther. When I saw it, I fell in love with the art form. I thought it was both beautiful and clever, both stunning and ingenious (maybe that's why I like Escher as well). While I wouldn't say that I obsessed over it, I always looked forward to the day when I'd be able to get a copy of that print for myself. That day eventually came when Eeees bought it for me early in our marriage. It now proudly hangs on our wall. 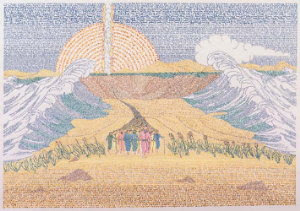 Over the years, I found other prints of his as well, including one of the Splitting of the Sea (the text of Sh'mos), the seige of Jericho (text of Joshua) and the skyline of Jerusalem (text of T'hillim/Psalms). However, I've noticed that at least some of his stuff is becoming harder to find. Yesterday, a reader wrote to me asking me about my Joshua print, stating that she couldn't find it anywhere on the web and asking if mine was for sale. I told her that mine wasn't for sale (I love it too much) but I did spend some time looking for it online. Oddly enough, the only picture I found of it online was the one that was on my blog about two years ago. I could not find a copy of the Esther print at all either. Which leads me to wonder if he is still active in the field, and if he is, why doesn't he set up a website? I'm willing to bet that there is enough of a demand for his work to warrant putting one up. I know that I would probably buy more works from him. I'd love to find out for sure if he's still working in this field and what new works he has. While we're at it, there is another artist that I happen to like in this field as well. Ellen Miller Braun works in Israel and makes some very nice micographic works (she'll also customize one for you for a bar mitzvah or the like). When Eeees and I were in Eretz Yisroel, we discovered her works and bought her Shir HaShirim. You can order them over the web (at the link above) and she'll even ship to the US. Any other micography fans out there? Let me hear from you. Yesterday was a busy day for Eeees and myself. In the morning, we had an opportunity to sit in our Walter's shiur (Gemara class). We got to meet the Rebbe and I got to see some of the kids who are in his Masmidim (Honors) class. However, what also impressed me was the diversity in the student body and in the class. Here was a class of boys that didn't all look like clones of each other. The boys all wore button-down shirts (as required by the dress code), but of all different colors. The yarmulkes ranged from knitted, to leather, to suede to velvet and in different sizes. Some were all black, others had designs and logos. There were kids from all different extractions -- Ashkenazim, Sefardim, (some who looked) Yemenite and probably from different levels of observance as well. It was quite a difference from the school where he came from, where all the kids were Ashkenazim (there may have been the occassional Sefardi in the school, but they were few and far between -- I think there was one in Walter's class), all wore white shirts/dark slacks, all wore the same yarmulkes and all, for the most part, had the same backgrounds and behaviors (or so we thought, anyway). This, I feel is a good thing. I would like Walter to understand that there are different types of people in the world and that not everyone has to be "just like him" to be a good person and that he shouldn't turn up his nose at someone just because they dress differently, have a different hashkafah or different ethnic background. I'm hoping that over the next four years, he learns the valuable lesson of accepting people despite their differences, rather than attacking them for being different from yourself (as we've seen in the news lately). Later on in the day, Eeees and I went to a reunion. When we were both in college, we both served on the Emergency Medical Squad in the college. Yesterday, there was a reunion of the members of the squad, going back to its founding 30 years ago. We got to meet with old friends, reminisce and swap stories with the old members, catch up on what was happening with their lives (Mike married Mary Kay??!!) and have a wonderful time. Since many members of the squad over the years were Orthodox, all the food was kosher. In many ways, I consider the time I spent in the squad the most valuable time that I spent in college -- in many cases, even more valuable than my class time. Having come from a high school much like Walter's elementary school (only much more so, if you can truly believe it), I never had much exposure to non-Orthodox Jews (except for family members) and non-Jews. As such, while I certainly a lot more tolerant of other people than my classmates in high school, it was here, in the squad, that I learned to form friendships with people from other backgrounds. It was here that I had the first opportunity to socialize with people who weren't strictly from "my own type." And it was here that I learned, for the first time, to accept people for who they are -- not for what minhagim they observe, or which religion they practice, how they dress or what they think about evolution or the origin of the world. When you're working with a team to save lives, you don't really care what religion the EMT next to you is. When you ask the dispatcher for the status of local hospitals, you don't really care whether or not she's dressed in a completely tznius fashion. You focus on one goal -- saving lives. And even when you're not actively involved in the saving of lives -- even if you're just hanging around in the office waiting for a call to come in -- you realize that you can work together and get along with and even be friends with people with whom you have no religious connection -- people who may be Jewish and non-Orthodox, people who may be devout Christians, Muslims or Hindus, or even those that are completely non-religious. *This* was what I learned in my time in the Emergency Medical Squad (along with lifesaving skills, teamwork skills, etc.) and, in many respects, that was far more valuable than the coursework that I took. When sports and concerts are forbidden, and all forms of kosher entertainment are off limits, we are asking for trouble. If our kids can’t find a place to vent their energy within a kosher environment, then they will find it elsewhere. In his article, he gives examples of times that he organized youth activities and met with resistance. In one case, he tried to have the boys in his Pirchei organization put on a play based on the book Family Aguilar. When people tried to have the play banned, the matter ended up being escalated to R. Moshe Feinstein. Instead of issuing a ban, R. Moshe gave it his blessing. In another example, he arranged for a two-day trip to Washington at low cost for boys. The trip was going to be taken on the two days that the yeshivos gave off for Channukah. One Rosh Yeshiva wrote R. Teitelbaum a nasty letter accusing him of encouraging bittul Torah. Fortunately, R. Teitelbaum was able to fend him off. It's very interesting that the difference between R. Teitelbaum's point of view and the point of view of others in our community is brought to my attention right now. Walter just began high school this week and it looks like he's going to have a great time there. He's encouraged about the learning programs, the secular education and the extracurricular activities. Indeed, when we went looking for a school, we purposely went looking for a place that had all three of these elements -- we wanted a school that had a great learning program that would keep him challenged and interested; we wanted a school with a quality secular studies department that would show him the possibilities that exist in our world, and a school that had supervised extracurricular activities for him to be able to channel his creative energies. I purposely didn't want to send him to a high school such as that I went to: where the learning was boring and uninteresting, where the secular studies were a joke, and the word "extracurricular" didn't exist because the school day went from 7:30 in the morning to 9:30 at night every day without variation; where the word "trip" didn't exist and the word "activity" might as well have been in Mongolian. In my old school, if it didn't involve learning, it shouldn't be done (although I suppose they did allow for some recreation -- boys were allowed to play basketball during recess). In looking for the type of school for Walter that recognizes that kids are kids and need kosher extracurricular activities, I find that I have explicitly rejected the opinions of the "banners" and embraced the opinion of R. Teitelbaum. I can only be thankful that there are rabbis out there, like Rabbi Teitelbaum, who have not forgotten what it is to be a kid and to need an outlet for youthful energies.